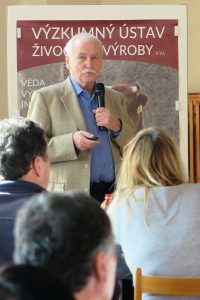 Farmers´ Day in Velká Chyška – Výzkumný ústav živočišné výroby, v.v.i. 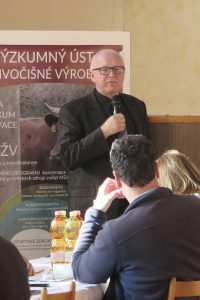 The Farmers´ Day was opened by František Pope, Chairman of the Board of Directors of ZD Velká Chyška. 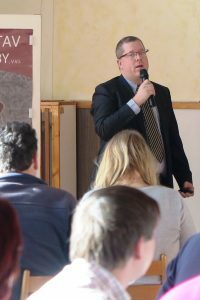 At the beginning, Václav Kudrna from the Institute of Animal Science (IAS) presented the current activities of IAS, what is new in IAS and what is offered to farmers, not only as part of consulting services. The lectures were attended by over 60 people, from farmers, designers and consultants to representatives of agricultural companies which provide services to farmers and breeders. presentation.pdf Ing. Jan Syrůček, Ph.D.
presentation.pdf Ing. Jindřich Kvapilík, DrSc. presentation.pdf doc. Ing. Luděk Stádník, Ph.D.
presentation.pdf MVDr. 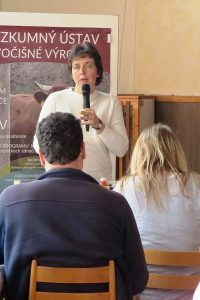 Soňa Šlosárková, Ph.D.
During the discussion a question was raised about inquiring and evaluation of manure and feed in a questionnaire survey on profitability of milk production, the results of which were presented. The answer revealed that the data are reported in the same form as they are recorded and accounted internally, e.g. purchased and in-house produced feedstuffs are monitored, with feed type, consumption by dairy cows and price (market or internal) being recorded.